Kate Bush eat your heart out! Recently it was brought to my attention that my wardrobe is full of blue things and that I should wear more red to harness my creativity (which otherwise tends to just run amok, and creativity just running around willy nilly in your backyard is apparently the last thing anyone needs). As you will have seen in recent posts, I actually do wear a fair bit of red when it comes to accessories, and I certainly don’t shy away from colour in my outfits, but I don’t own much in the way of red garments. I think it’s because unless it’s the perfect shade, it tends to clash with my complexion, which is often also quite red… so much so that when my cousin saw pictures of my year 11 formal (which was, after all, an extremely recent event, and didn’t take place nearly 20 years ago in the 90s or anything like that*), she said I shouldn’t have worn so much blush. I was not wearing ANY and have never even TOUCHED the stuff … I have at times even resorted to wearing foundation to TONE DOWN my overly zealous healthy glow. 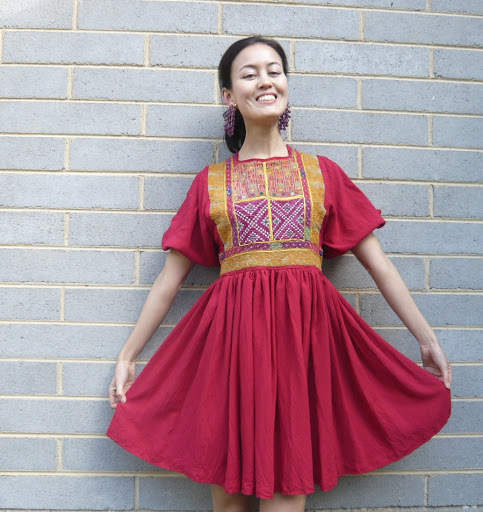 Anyway what I was getting around to saying is that for whatever reason, I don’t often wear red clothes, but when I stumbled on this dress at the Salvos last year it made me smile straight away… it’s colourful AND ethnic (for want of a better word) AND secondhand AND cheap ($7 I think?) so it fitted all my retail requirements. Only problem was it was very long and shapeless and the way it had been constructed presented quite a challenge (you’ll just have to believe me because I don’t have any “before” shots of this one). It had long baggy sleeves with embroidered cuffs which unfortunately had to be sacrificed to give it a cleaner line, the high waistline and thick embroidery made me look pregnant, and the calf-length skirt and wonky zip at the back were not exactly flattering either, so the hem got chopped, the zip got replaced, and I too k it in a bit around the waist. I’m guessing that it was hand made for/by a girl of Afghani or perhaps Pakistani origin, judging by the style and the embroidery (which I think is machine-made)? 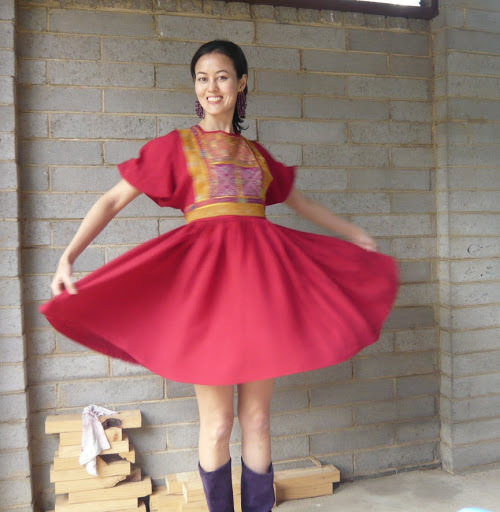 My theory is that after she came to Australia she wanted to wear more local sort of stuff and threw out her old wardrobe. I got this at the same place as I bought the Indian top. I wore this to book club last night but no one else showed up so I’m having to show it off here instead, along with earrings which are also from the Salvos and purple boots from a sample sale in Tokyo years ago! *gahhhhH!!! how is it nearly TWO DECADES since I was at high school?! Before you know it I’m going to start doing old lady things like crochet, for goodness’ sake…. omg! i am totally feeling the dress…gorgeous! A total loss for your book-club friends…they missed out on seeing it in person! Looks great, you are just too too clever!!! 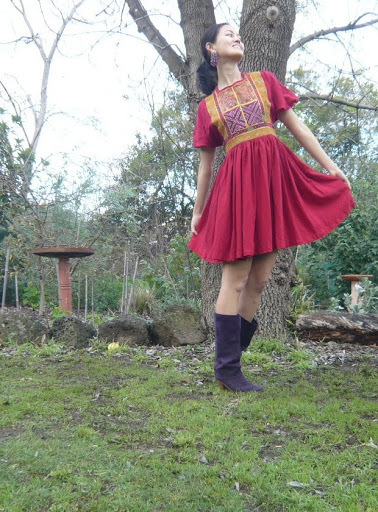 lovely dress and great colors on you! Red is my favourite! So sad that no-one showed for Book Club when you were looking so fabulous. Oh well at least you have us to share it with! Oh thank you everyone … all the lovely comments make it worth my while getting my boots all muddy! I saw this post before work this morning and had 'it's meeeeeeeee catheeeeeeeeee' going round in my head all day! So errrr… thanks for that! The dress looks gorgeous and I also love the colour. I wonder how long you have to wear red for until it works its magic? I might have to do a red experiment! All part of the service Clare… just be glad I didn't do a post about MC Hammer…! !The red still hasn't worked, but I spent all day yesterday in crappy navy stuff as I was cleaning the garage, so I haven't really tested the theory properly yet! omg, your blog is amaaazing, i was checking each post since it's my first time hereplease tell me when you will be in dubai any time sooner <3you work is sooooooooo breathtaking with these colours! love love love love love love love.Love. that is a lovely dress!! you did such a nice job with such a great find.